NonAblative 1450-nm Diode Laser in the treatment of Facial Atrophic Acne Scars in Dark Skin Types: A Clinical Study. EDOJ vol 2 (2): 8, Dec. 2006. Nonablative 1450-nm Diode Laser in the Treatment of Facial Atrophic Acne Scars in Skin Types III and IV: A Clinical Study. Sahar Ghannam, M.D. and Ezzat A. Badawy, M.D. Egyptian Dermatology Online Journal 2 (2):8, December 2006. Accepted for publication in: November, 2006. Background: All post-acne scars are the result of an inflammatory response to an initial lesion, which may terminate in collagen destruction, dermal atrophy and fibrosis. Treatment of acne scars is a challenging matter for the dermatologists. A new concept of non-ablative laser remodeling has been developed with no downtime, minimal secondary effect or risk of scarring. The objective: This study was aimed to evaluate the efficacy of the non-ablative 1450-nm Diode laser with dynamic cooling in the treatment of atrophic and mixed pattern of facial acne scars. Patients and methods: The patients included in the study were 46 patients having acne scars (42 females and 4 males), with Fitzpatrick skin phototypes III and IV (34 were skin type III, 12 were skin type IV). The 1450-nm diode laser was used at fluence ranging from 10 J/cm² to 14 J/cm², using 6 mm spot size. In each session, two laser passes were done. The dynamic cooling device delivered cryogenic spray spurts totaling 40 msec. Number of treatments ranged between 1 session to 11sessions. Results: The results were assessed according to patient satisfaction and the physicians view of improvement. Only six patients [13%] were highly satisfied, six patients satisfied, 12 patients [26.1%] were neutral and 22 patients [47.8%] were dissatisfied. According to the physician evaluation, two patients only [4.3%] were recorded as having dramatic improvement, 7 patients [15.2%] as moderate improvement, 14 patients [30.4%] as slight improvement and no improvement in 23 patients [50%]. Hyperpigmentation was seen in nine patients (19.6%). The study demonstrated a positive significant correlation between the number of treatments received and the degree of scar improvement. Conclusion: In some cases, the 1450-nm diode laser can improve the cosmetic appearance of atrophic acne scarring. Nevertheless, in most cases the non-ablative 1450 -nm laser non-ablative resurfacing had so far failed to provide more than subtle effects. Hyperpigmentation is common with the 1450-nm diode laser especially in skin types III-IV. A scar is composed of fibrous tissue formed in response to an inflammatory or traumatic injury to the skin that differs in elevation and texture from normal surrounding skin. Moderate and severe types of acne usually give rise to scars when the inflammatory process has been subsided. All post-acne scars are the result of an inflammatory response to an initial lesion, which may terminate in collagen destruction, dermal atrophy and fibrosis . Treatment of acne scars is a challenging matter for the dermatologists. Chemical peeling [2,3], dermabrasion  or ablative laser resurfacing with either carbon-dioxide (CO2) or erbium:yttrium-aluminum-garnet (Er:YAG) [5,6] can be carried to those patients. These procedures are based on removal of the epidermis, creation of a controlled thermal injury in the dermis, and subsequent production of collagen and remodeling of the dermal extracellular matrix . However, these methods have the disadvantages of the extended downtime and the potential for serious complications such as scarring, infection, and dyspigmentation. Other procedures such as injection of fillers, punch grafts, subcision and autologous fat transfer have varying degrees of improvement of acne scars . A new concept of non-ablative laser remodeling with no downtime, minimal secondary effect or risk of scarring has been developed. The non-ablative remodeling can be performed with the 585-nm pulsed dye , 1064-nm Nd:YAG , 1320-nm Nd:YAG , 1540-nm Erbium glass , 980-nm diode , 1450nm diode  lasers, and an intense pulsed light source . This non-ablative process involves inducing a controlled thermal damage in the dermis that, in time, leads to neo-collagen production while preserving the epidermis. The process of the non-ablative lasers involves delivering pulses of laser energy at wavelengths that are absorbed by water in the upper dermis, sparing the epidermis. The absorbed energy is converted into heat causing controlled residual thermal injury to the collagen in the upper dermis. Regeneration of the partially damaged collagen results in remolding that has been confirmed histologically and this translates to clinical improvement of treated rhytides and scars. Statistically significant increases in type I procollagen messenger RNA expression was seen after treating the skin with non-ablative laser. Moreover, substantial induction of type III procollagen, various matrix metalloproteinases, and primary cytokines was also demonstrated . The objective of this study was to evaluate the efficacy of the non-ablative 1450-nm Diode laser with dynamic cooling in the treatment of atrophic and mixed pattern of facial acne scars. This clinical study was carried out on patients suffering from facial acne scarring. Possible desirable effects, side effects and complications of the non-ablative laser were discussed with the patients. The patients signed consents on getting laser treatment for their acne scarring. Patients with a history of keloids, isotretinoin treatment, dermabrasion, phenol peel, laser resurfacing (ablative or non-ablative) or filler injection were excluded from the study. All patients were photographed before each treatment and after the last visit. A topical anesthetic cream "EMLA" (AstraZeneca LP, Wilmington, Del) was applied to the treated skin at least one hour before treatment session. Test spot was done before the first session. The test spot was carried out on three spots in periauricular region using three different laser fluences; 10 J/cm², 11 J/cm² and 12 J/cm². Treatment was carried out by a laser surgeon delivering the 1450-nm diode laser [Smooth Beam; Candela Laser Corp., Wayland, MA, USA.]. The 1450-nm diode laser was used at fluence ranging from 10 J/cm² to 14 J/cm², using 6 mm spot size. In each session, two laser passes were done, first one was non-overlapping over the entire face, second one was only on the scars. The dynamic cooling device delivered cryogenic spray (tetrafluorothane -26ºC) spurts totaling 40 msec (10 msec pre-laser, 20 msec with laser beam and 10 msec post-laser). Number of treatments ranged between 1 session to 11sessions [mean3.86]. Sun protection cream was applied immediately after the laser session. No oral medication was given at home neither before or after treatment. Treatment sessions were performed at 3 weeks intervals. All the patients were evaluated before each session and in the follow up visit. The patients were seen after a follow up period ranged from 3-6 months. Results were assessed according to patient satisfaction and the physician view of improvement. Patients expressed their satisfaction on a scale of four levels; highly satisfied, satisfied, neutral and dissatisfied. Physician evaluation was carried out on the clinical changes present in comparison to the baseline, following a scale of four levels; dramatic improvement, moderate improvement, slight improvement and no improvement. Photographs were taken before each session and in the follow up visit. The patients included in the study were 46 patients having acne scars (42 females and 4 males), with Fitzpatrick skin phototypes III and IV (34 were skin type III, 12 were skin type IV). Their age ranged from 20 years to 52 years (Mean 32.87 years). Patient Satisfaction: According to the satisfaction expressed by the patients themselves, only six patients [13%] were highly satisfied (Figure 1, 2). Table (1) shows the degree of the patient satisfaction. Side Effects: The side effects seen in our patients are shown in table (2). Nine patients (19.6%) got hyperpigmentation (Figure 3). However, severe pain, flaring of acne (Figure 4), severe erythema, and edema were noticed in varying number of patients. No patient had got burn or pitted scars. Completion of treatment: Out of 46 patients included in the study, 32 patients (69%) completed at least three treatment sessions. Fourteen patients (14%) discontinued treatment and they were considered as dissatisfied patients. The only positive significant clinical correlation was found between the number of sessions and the degree of improvement that was evident by patient satisfaction and physician evaluation. 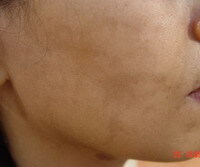 Fig 3: Female patient with post-laser hyperpigmentation. Fig 4: Female patient with flare up of acne during treatment. Ablative resurfacing lasers (CO2 and Er:YAG) produce heat that is deposited into the dermis. This heat causes the collagen contraction necessary for the tightening effect desired when using these lasers to resurface the skin in treating rhytides Both lasers remove skin, leaving an open wound with potential for infection and a lengthy postoperative recovery period with potential for prolonged erythema and hyperpigmentation. The non-ablative laser treatment showed clinical improvement of different types of scars. Several studies have shown the efficacy of different non-ablative lasers in treating scars and rhytides. Long-pulsed 1320-nm Nd:YAG and 1450-nm diode lasers had shown clinical improvement in treating patients with atrophic scarring . Acne scars and photo-damaged facial rhytides were improved with 585-nm flashlamp pulsed dye laser [15,16]. Moreover, the non-ablative 1540nm Er:Glass laser showed clinical improvement of facial rhytides, although the effect was slow and mild [11,17]. Although the selective heating of dermal collagen was documented by several studies, all the available non-ablative resurfacing procedures have failed to provide more than subtle effects . While dermal heating is essential in non-ablative remodeling, the epidermis should be protected by a cooling device. The parameters of the cooling duration could influence the clinical effects. Goldberg et al  have treated twenty subjects having rhytides with skin types I-IV with 1450-nm diode laser using dynamic cooling. With 2-4 laser treatments, thirteen subjects showed clinical improvement. They used pre-, intermediate-, and post-laser cryogen cooling ranging from 40-80 milliseconds in total . Pitted scars were noticed in three of ten patients after using a cryogen spray of 20 milliseconds and a delay of 10 milliseconds before the 1320-nm Nd:YAG laser . However, the dynamic cryogen cooling for 30 milliseconds with a delay time of 40 milliseconds did not show pitted scars in ten patients treated by the same laser in another study . The details of the molecular mechanisms whereby non-ablative laser therapy may work, is still lacking although several mechanisms have been hypothesized. Most frequently accepted is the idea that heating of the dermis through absorption of laser energy may cause a dermal wound-healing response involving fibroblast activation and new collagen deposition . Some researchers thought that cytokine-mediated responses induced by absorbed laser energy, may lead to collagen remodeling. Nouri et al have demonstrated that collagen III expressions significantly increased when using non-ablative laser energy. They used sheets of Apligraf which received different energies of 1450-nm diode laser. Laser treatment was found to increase collagen III mRNA expression when using energy level of 10J. Maximum induction of collagen III mRNA was seen at 12 J . Lasers used in non-ablative resurfacing have wavelengths in the infrared range, penetrating into the dermis without harming the epidermis [19,24]. Post-treatment erythema was seen in all patients after 1450-nm diode laser treatment persisting for 24 hours in a study done by Tanzi and Alster in 2004. They reported post-inflammatory hyperpigmentation observed in four out of twenty patients treated by 1450-nm diode laser. However, 1320-nm Nd:YAG laser caused post-inflammatory hyperpigmentation in two patients only in the same study . Hyperpigmentation occurred as an adverse effect after several laser treatments . The significant incidence of hyperpigmentation observed is alarming and also interesting, as the 1450-nm wavelength is not well absorbed by melanin. The cause of this pigmentation may be related to the inflammatory process or the vascular effect of the cooling spray and not directly to the laser rays. It was suggested that the cryogenic cooling systems themselves can cause hyperpigmentation. A study of 57 patients treated for facial scarring recorded a hyperpigmentation rate of 39%. The investigators suggested that the hyperpigmentation may have been a result of the sensitivity of Asian skin types to injury from the cryogenic spray cooling system. Hyperpigmentation could be minimized by reducing the duration of the spray pulse from the dynamic cooling device from 50 to 40 milliseconds . Tanzi et al have attributed the hyperpigmentation to the amount of the dynamic cooling (being 60 msec total) during non-ablative treatments with 1450-nm diode laser . In our study, the amount of the dynamic cooling was 40 msec. It was difficult to make it less than 40 msec otherwise, the effect of laser would be ablative rather than non-ablative. Goldberg et al noticed hyperpigmentation in one patient treated with the cooling cryogen alone while no patient had developed hyperpigmentation using 1450-nm diode laser . The other possible contributing factor to this hyperpigmentation in other studies was the high fluence used but decreasing the energy to 10J or less would sacrifice final clinical results .As it has been shown that the maximum induction of type 111 collagen MRNA expression at 12J . The fact that most cases of hyperpigmentation were observed after the second or third treatment, may indicate that the treatments intervals may have been too short. Evaluation of long treatments interval should be studied. The study demonstrated a positive significant correlation between the number of treatments received and the degree of scar improvement as assessed by patients themselves as well as the physician. This finding is quite logic. It seems that collagen synthesis increases with getting more laser treatments. Higher average of facial scars' improvement was seen after each treatment with 1450-nm diode laser . Moreover, increased dermal collagen evident by histopathology was seen 6 months after treatment with both 1450-nm diode and 1320-nm Nd:YAG lasers. During the 6 months follow up period the clinical improvement was still increasing . However, we can conclude that, in some cases, the 1450-nm diode laser can improve the cosmetic appearance of atrophic acne scarring. Nevertheless, in most cases, the non-ablative resurfacing using 1450 -nm diode laser had so far failed to provide more than subtle effects. Patients should not have great unrealistic expectation of this type of laser in treating their acne scars. Moreover, patients should be thoroughly informed about the possible side effects and hyperpigmentation in particular. Although significant collagen marker upregulation is confirmed histologically, this does not usually correlate with the clinical results. The same conclusion was reached by Hardaway et al. They stated that the clinical improvement of rhytides in their patients treated by 1450 -nm diode laser was mild and did not correlate well with the degree of histologic changes seen . Non-ablative lasers should not be used as the sole modality for treatment, myriad techniques should also be available including subcision, punch excision, elevation, fillers and peels. 21. Goldberg DJ. Non-ablative subsurfacing remodeling: clinical and histologic evaluation of a 1320-nm YAG laser. J Cutan Laser Ther 1999; 1: 153-67. 24. Paithankar DY, Ross EV, Saleh BA, Blair MA, Graham BS. Acne treatment with a 1,450 nm wavelength laser and cryogen spray cooling. Lasers Surg Med 2002; 31: 206-14. 28. Nouri K, Zhang YP, Singer L, Zhu L, Huo R, Ricotti C, Prodanovich S, Li J. Effect of the 1,450 nm diode non-ablative laser on collagen expression in an artificial skin model. Lasers Surg Med. 2005 Jul;37(1):97-102.